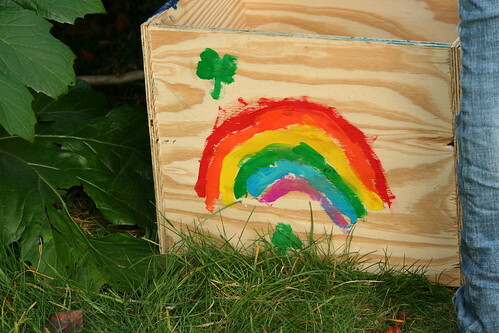 Leprechaun Trap, originally uploaded by Temeculamom. I am of Irish descent (I come from O’Sullivans, O’Callaghans, and Doughertys), but we don’t usually do much for St. Patrick’s Day except make corned beef and cabbage for dinner, which my husband loves. But my youngest decided to make a leprechaun trap, and her older brother and sister actually helped her for once. Zachary made the box for her, and Sophia painted it with some spelling tips from Isabella. Sophia put food inside, and a sleeping bag for the leprechaun. She then mad a wish that she would catch a leprechaun. This morning Sophia told me her wish had come true, but she should have been more careful in what she asked for. She said that she did catch a leprechaun–the naughty little creature had eaten the food and moved the sleeping bag–but, unfortunately, he had escaped before she got to see him. She was quite unhappy about missing out on that pot of gold. All three kids wore green today, but they were so detailed in their preparations that they ended up being late. The older two blamed the youngest for making them late. So she ended up in tears, and the oldest refused to be photographed. Ah, life with children! What an unending stream of joy. ~ by bekaboo on March 17, 2009. Happy St Paddy’s day to you and yours, Beka! I’m glad to see it’s not only my children who do those kind of things! But they do look really good in their green. 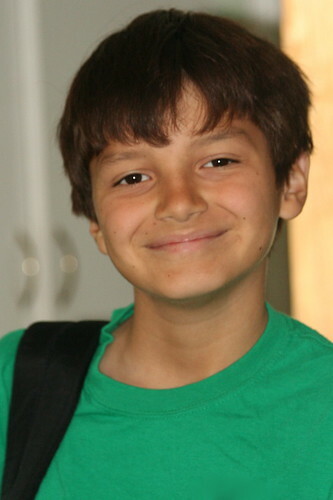 Ethan wore green to school, they had a mufti day so the children didn’t have to wear their uniform. The teacher painted green shamrocks on all the kids’ cheeks, so cool! 🙂 Love the leprechaun trap!!!! 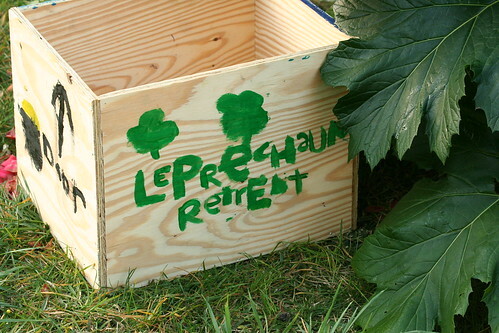 LOVE the leprechaun trap … absolutely inspired. Sorry to hear there was so much mayhem at the start of your day!! Your kids are so clever! 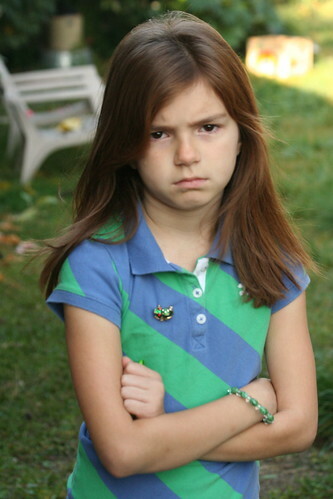 I love the last photo of Sophia the best, she’s adorable when she’s mad! LOL! Our st. pats day didn’t go as smoothly as planned either. Big hugs to all.